HSSC is a self-governing institution. Our aim is therefore not to yield a profit, but to provide better fishing conditions by the water locks in Hvide Sande. Revenues gained through the sale of fishing cards are used to pay for the establishment, maintenance and further development of HSSC. So, look forward to new and exciting facilities and events in the future. What does a admission card give access to? When you have purchased a valid HSSC admission card, you are given access to the fishing zones by the water locks in Hvide Sande. You are also free to use the large, and well-equipped gutting room. Here, you are able to gut, pack and put your fish in cold storage in a practical and confortable environment - without having to think of where to put your fish waste. 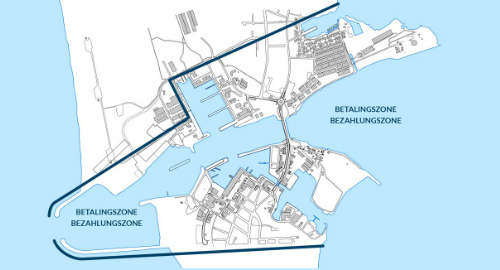 The payment zones reaches from the east and west of the water locks. You are only allowed to fish within these zones if you are wearing a visible HSSC admission card. Children under the age of 13 fish for free and without admission card in the payment zones. They also have free access to the gutting facilities. Please notice that fishing in the payment zones or use of the cutting room facilities without a valid admission card will issue a fine of DKK 500. From the 1st of November to the 14th of March, HSSC is closed. During this period, an HSSC admission card is therefore not required.